These issues are bad news for almost any kind of fuel user - fuel distributors (and their customers), truck fleet, users of emergency stored fuel, you name it. Fuel storage tanks also go hand in hand with development of microbial presence in stored fuels, leading to both biomass formation and expensive tank corrosion. The tank corrosion increases capital expenses as expensive parts need to be replaced. And the formation of biomass from microbial presence can cause headaches in addition to expense, as biomass formation tend to shield microbes from the killing effects of biocides. This increases the chances of reinfection of fuel systems, and the larger/more complex the fuel system is, the greater the chance of this happening. Stored fuel users have an effective solution for these problems with BELL TANK TREATMENT SDF. Its concentrated formulation (1 gallon treats up to 20,000 gallons of fuel) penetrates and disperses both fuel sludge and microbial organic biomass, suspending these in the fuel to be combusted. This creates a cleaner fuel storage environment. Beyond this, it also improves the effectiveness of fuel biocides by breaking up and removing the biomass that may shield fuel microbes from biocide contact. Use of BELL TANK TREATMENT SDF in conjunction with an effective fuel biocide like BELLICIDE is an excellent way to maximize antimicrobial treatment effectiveness. Beyond knocking out microbes and dispersing tank sludge, users also see real benefits with the long-term health of their storage tanks. 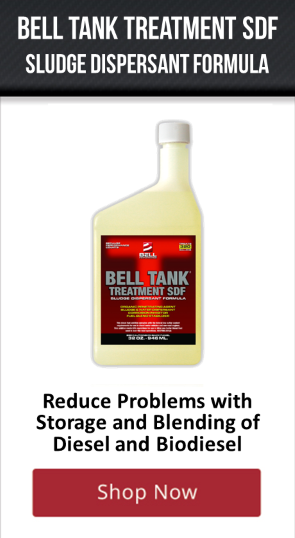 BELL TANK TREATMENT SDF fights tank corrosion both by emulsifying accumulated water and by laying down film protection against tank corrosion. Its unique amide chemistry shields tank surfaces both from corrosion damage and from the buildup and adherence of both biomass and sludge on the surfaces themselves.